Suwarna hides the keys from Manish. Manish gets a doubt on her, but she doesn’t tell him anything. Naira has eyes on the door and misses Kartik. She dances with the family and celebrates Teej. She finds Naitik crying and hugs him. Suwarna prays that Kartik returns home soon and breaks Naira’s fast. Naitik gets a stunning call about Kartik’s accident. Naitik couldn’t bear this news. Naitik reveals to everyone about Kartik’s accident. Naira hears this news and loses consciousness. Naitik and Naksh meet the Goenkas at the hospital. They learn from inspector that Kartik has slipped in coma. Manish sees the thief in Kartik’s place and tells inspector that the guy admitted is not Kartik. The inspector finds out and tells about the robbery case. He assures Manish that he will find Kartik. They all ask if they could accompany him to the accident site. Inspector allows them. They try to find Kartik. Naira gets conscious. She worriedly asks for Kartik. Ananya asks her not to worry. Naira prays for Kartik. Manish and Naitik worry seeing the car’s crushed state. Inspector tells them that they didn’t find Kartik around the site. Kartik goes missing, which makes them get more worried. Dadi and Suwarna meet the Singhanias, and tell about Naira and Kartik’s fight. Everyone prays for Naira and Kartik’s first Teej to happen well. They pray for Kartik’s safe return. Naira goes to find Kartik. Suwarna is sure that Naira will bring Kartik back. Naitik and Naksh get worried on knowing Naira left home to find Kartik. 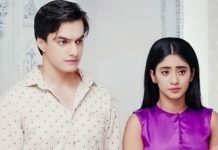 Naira worries for Kartik’s life. After much difficulty, Naira succeeds in finding Kartik.